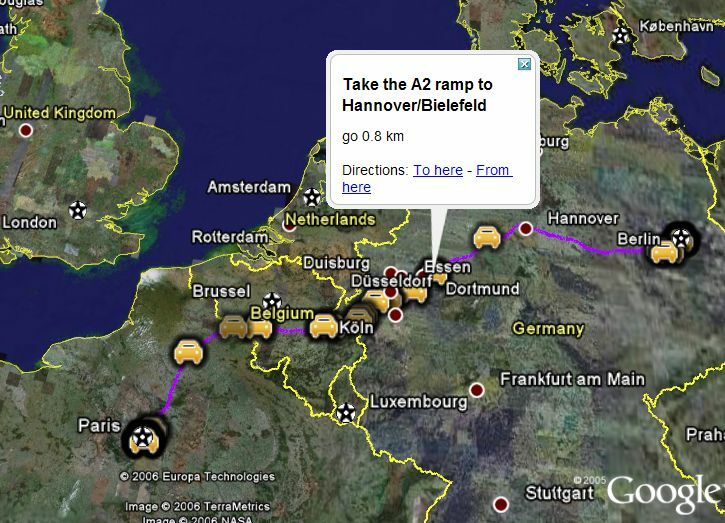 Part of the recent updates included yet another previously unexposed feature: You can now get driving directions for many European countries in Google Earth and Google Maps. So, for example: Paris to Berlin: in Google Maps, and Google Earth . In Google Maps you still can't see the roads in most of Europe, but the data is there for the directions. You CAN see the roads in the "Roads" layer of Google Earth though. Street addresses are also working in most of Europe as well. Here is an example between two addresses in Paris. Interestingly, you can tack on "&output=kml" to the URL for Google Maps' "Link to this" for directions, and the directions will be loaded up in Google Earth. Via OgleEarth who heard about it from the French Google-centric blog: Zorgloob. Also note that Japan has map data, in Japanese! It seems that now the road maps are seriously misaligned in Calgary (Canada) on Google Maps (see the hybrid view). When I looked at it a few days ago, it was misaligned on Google Earth, but it was fine in Google Maps. It may be because of the base imagery update.